Within hours of being born Annabel met her parents, both sets of grandparents, two aunts, and many family friends. There was one very important family member, however, that she didn’t meet until she left the hospital and went home…Rigby! In time though I know Rigby and Annie will bond because Rigby and Madeline became buddies somewhere around Madeline’s first birthday. Previously uninterested in Rigby, Madeline suddenly found Rigby very funny, and would laugh whenever she’d bark. She would also grab her fur and pull on it with the delicacy of a professional wrestler. Heather and I used to take Maddie’s hand when she did this and then run it gently over Rigby’s back while saying, “Nice pets. Nice pets.” Maddie understood and tugged at Rigby’s fur a little less fervently. Rigby, bless her heart, endured it stoically for the most part. It’s hard to know what Rigby went through after Madeline passed away. Her little buddy never came home. One part of me thinks, “Hey, she’s just a dog. All she cares about is getting fed and taken out to the bathroom.” But the other part of me worries that she, like Heather and me, is mourning the lost member of her pack. If that’s the case, here’s hoping adding Annabel to the pack brings a little light back into her life just as it did for me. your family is so full of love. it shows in everything you both write. and in the photos. .-= rachel´s last blog ..laughter, blood and great light =-. so true. the love certainly does show through in everything. I have no doubt that Rigby misses Maddie terribly. We all miss her, even those that didn’t get to meet her in person… So how could Rigby not miss her? Agreed. I absolutely believe that Rigby might have mourned the loss of Maddie. Animals are enormously sensitive beings. I second (third?) this. And when dogs love their people, they LOVE their people. I believe that dogs know when their people don’t feel well and imagine you are right about her knowing that Maddie was not well. They’re so intuitive. Both your lovely daughters are fortunate to be watched over by this loving pup, and she is blessed by them as well. .-= Rebekah´s last blog ..trust =-. Annie is just so Cute! Oh those lips! I could just dip her in my tea! When we lost our cat, our dog was definitely not herself and kept looking around the house for him. Two months later she still seems sad that he’s not around. And although I know losing a cat is NOT the same as losing a precious child, he was still a member of our dogs pack and is missed. So I am sure that little Rigby is missing her friend Madeline. And although Annie can never replace her sister, she is a new member of the pack and will surely become the best of friends with Rigby! Our dog is only now starting to take a bit more of an interest in our 8 month old son, but she is still wary of his hands that like to grab her fur! I am looking forward to Ewan and Lola becoming fast friends. There is nothing better than the friendship between a child and their beloved dog! What sweet photos. Is Rigby a Havanese? We have two little white Havanese and she looks a LOT like them. Congratulations on your precious little one. Drink in all that love and joy. .-= Julia Janzen´s last blog ..The Wonderful Masterpiece, “Cranford” =-. What sweet pictures of Rigby with Madeline ,who although I never got to meet her in person is so adorable.A picture is worth a thousand words and that says alot! .-= Michelle´s last blog ..Vancouver In A Time Lapse =-. Is it my screen or the light in the photos, but the wall behind Maddie looks blue, the wall behind Annie looks purple …. Am I imagining things? I love the picture of Annie & Rigby because of the purple wall, to me it shows Maddie’s sprit in the picture as well. I think it is your screen and the light. To me, it looks like the same wall, just lit differently. Notice how the chair looks different, too. The wall behind Maddie looks like the background of this blog to me, a bluer lavender, and the wall behind Annie appears to be more plum. I don’t know for sure, but I’m guessing it is the lighting. I love the picture of Maddie and Rigby. Something in Rigby’s expression is so at ease in that photo. It looks like he isnt too sure about this new little person in the 2nd photo, but you are right, they will be best friends in no time! Your family is so beautiful. All five of you. My bet is they become fast friends in no time. I’m so very happy for your family for all the love and joy you share. It is a real blessing. Love to you all. I’ve had jobs in a few different fields throughout my life and half of them have been working with animals. They definitely mourn the loss of a family member. Some do it in very visible ways and some don’t in ways that are easily recognizable, but they all do. Luckily, because you guys treat Rigby with love she is going to be ok, but yeah, she misses Maddie too. And yes, Annabel is going to help her feel better. It’d take way too long for me to write all the examples I know of that make me sure of this, but I am sure. Thank you for letting us know how she’s doing – a lot of us had been wondering. I love the photos! And I hope Heather continues to recover nicely. Between you and Rigby, it sounds like she’s in good hands. Beautiful pictures, beautiful family. Thanks for sharing! .-= Kerri´s last blog ..beginnings =-. Both pictures of the girls with Rigby are adorable! I love the one with Annie and Rigby……both catching glimpses of each other. I wonder what they are each thinking………. Annie and Rigby will be best friends soon, I’m sure of it! Thank you so much for sharing your beautiful family. You are sooooooo blessed and I am very happy that you are! i know it will. Bless you guys and beautiful Annie! .-= Keyona´s last blog ..What Being Sick ISN’T Supposed To Mean =-. .-= lisa´s last blog ..lamenting =-. I absolutely believe Rigby misses Maddie. Pets are so sensitive and I’m sure Rigby senses your sadness as well as Maddie’s absence. I love how Rigby and Annabel look like they’re checking each other out in that picture. She’s just a doll! .-= Noelle´s last blog ..Two cents =-. Darling photos, and a darling dog. She’s such an important part of your family, I’m so glad she’s feeling better. I’m sure she and Annabel will be best of friends! .-= Kate @ UpsideBackwards´s last blog ..The worst holiday ever =-. Okay, seriously, I’m bawling. When I got to the part about Rigby missing her little friend, I lost it, you are probably so right. Who would have thought… I’m so happy that Annie has brought some light back into your lives, it has been much needed I’m sure. What a gorgeous picture! I think he looks like he’s guarding her – keeping an eye out to see that she doesn’t go anywhere without him knowing about it! What a lucky little girl to have such a lovely dog to grow up with. .-= Jennie´s last blog ..Things to make me glad =-. Aw, Rigby and Annie are so cute together. Here’s to watching a new friendship form! .-= Lynn from For Love or Funny´s last blog ..My husband lied to me. =-. I’m positive Rigby misses Madeline. Growing I had a dog that was my father’s best friend. Every evening she would wait at th window @ exactly 4:45 and watch for his car to come down the street. When my father was killed in an accident, you could SEE the confusion in the dog that her friend hadn’t come home. Every day for months, she continued to wait by the window a 4:45. She was never the same peppy dog after he was gone. Thankfully, Rigby has been given second chance at love! omg, that is so sad, but at the same time such a heart warming story of the love between a dog and his best friend. Thanks for sharing that with us. Wow. This comment made me cry and my stomach turned over at the thought of your poor poppy being confused and not knowing why her friend was gone. It is so sweet that dogs love their humans SO much. What a heartwarming (and heartbreaking at the same time) story. Thank you for sharing and I am sorry about the loss of your dad. I’m sure that Rigby misses her Maddie Moo also. And she might be a little confused by the new princess in the house. Rigby will know it is not Maddie, and that no one can replace her, but just like her mommy and daddy, she will love Annabel completely. It really is amazing how much the heart can love someone new, even when a part of it forever belongs to someone else. Hugs, prayers and love to the entire Spohr family~ all five of you! I love the photos! So glad that you are all acclimating to your new lifestyle. And I totally agree with all those above that say that Rigby misses Maddie. I do not know how long an animal remembers a person, but I know my dog remembers my sister from the last time she stayed in my house a year ago, as does my cat. So sweet! Great photos. Awwww. I absolutely believe that Rigby misses Maddie. Our dog Sampson is like Rigby, seems he knows when someone doesnt feel well, or is “off” I think its cute that she is protecting Heather that way. She will do the same with Annie love the photos..
.-= jenn´s last blog ..Out Of The Mind Of A Pig =-. Rigby rules! Love the pics, and I am sure she is thrilled to have another little friend. I think animals know way more than most people give them credit for, What a sweetheart that Rigby is. I hope she and Annabel are fast friends. .-= AmazingGreis´s last blog ..Emotions; Part 1 – Layla Grace… =-. As others have said, for sure Rigby misses Maddie. Dogs have the ability to love so how could she not miss her friend? It will be exciting to watch this new relationship develop! .-= Liz´s last blog ..Family Stuff =-. I have no doubt that Rigby feels the loss of Maddie. And I have not doubt they’ll be the best of friends. .-= Jill´s last blog ..Being sick has SOME advantages =-. Rigby will love Annie, just like he loved Maddie but not in place of her. When you make new friends you don’t replace the old. THey will get on just great. .-= charlane´s last blog ..Dear God, When I asked for a reason to stay home on Monday morning, this was not exactly what I had in mind! =-. That was so moving. I can only imagine that what Rigby went through; how confused she was when Maddie didn’t come back and you and Heather were grieving. She couldn’t ask why and couldn’t share her own feelings. Damm dogs are so super smart. Rigby is saying, she doesn’t smell like Maddie, what is going on? But very soon these two adorable gifts from above will bond and grow to love and protect each other! I get a little tingling sensation from reading that you have a little more light in your life. That ROCKS! Annie is beautiful. Rigby is a lucky girl! I agree and holy moly does Annie look like her Dad!! Aw, how could RIgby not have missed Maddie? At the very least, she probably wondered for quite a while where Maddie was and when she was going to come home. That picture is so sweet! I’m sure Rigby misses Maddie. We all do. And I’m also sure that Rigby and Annie will be “bestest friends” in only a matter of time! .-= jen´s last blog ..on the menu Monday- Pizza Rolls =-. Love both pictures! I’m sure Rigby misses Maddie and also picked up on your emotions. I’m sure that soon Rigby and Annie will be best of friends. Continued wishes to Heather for a speedy recovery. I’m a dog lover. I’ve got a 6 year-old Lab who thinks she is a person. It melts my heart to see Rigby in that chair with Annie. I think you’re right when you say that she misses Maddie. And I think you’re also right about Annie bringing some much-needed light back into your lives. So well-written! .-= Andrea´s last blog ..A Gift for a Sweet Baby Boy =-. OMG, these are so cute!! Congratulations on your precious Annabel. I have followed your story for quite a while now and am so happy for you both. As a lover of animals and having lost two sister schnauzers after they were with me for 16 years, I would chime in and say Rigby knew and knows now…I feel like my dogs know not just what they feel, but they knew what I felt in my life. My father broke his hip in a skiing accident and my mom had called me to let me know. I was crying in the living room (I’m kind of a loud cryer) and my precious Hannah (schnauzer girl) started howling…I would surmise, not so much from the sound of my cry, but from the feeling she knew I was experiencing. Huge congratulations to you both and love love love the two pictures !! .-= Jana´s last blog ..One idea =-. I just know that rigby felt the loss of maddie very deeply. Animals can see things that we can’t. I cannot wait to see annie’s and rigby’s relationship progress!! What a sweet picture. It breaks my heart that maddie is gone . Rigby doesnt quite understands what is going on. They are not stupid by all means. She will be a good freind to Annie like she was to Maddie. Rigby may be “just a dog” but she’s got feelings too and I know she misses Maddie terribly. Whenever our dog does something wrong and gets in trouble, that little tucked tail and sad face let me know that he’s got feelings too. I’m sure that Annie’s happy little face is bringing Rigby as much joy as she’s bringing you. .-= Karen Chatters´s last blog ..Confusion =-. Honestly, that has to be the cutest damn baby in the whole world! I can’t believe how much she looks like Mike!!! You are very blessed! She’s a beauty! There is no doubt in my mind that Rigby misses Maddie. I am sure that Rigby and Annie are going to be the best of friends. What a cute pic! Awww…great picture! I’m sure Rigby has gone through her own mourning as well. When we adopted our dog from another family, she was sad for weeks. And then when they’d come visit, she’d stare out the window for hours after they’d left. I think dogs get it. Here’s hoping Annie and Rigby become the best of friends! What a moment Heather caught! Rigby already looks in love with Annie! I caught a great pic once with our dog and the kids. It had snowed during the night and the kids were so excited. They were looking out the window and our little dog put her paws up on the ledge and looked out too. I got the back of all three of them and the snow out the window. You can’t see their faces but can almost feel their excitement. It’s funny how animals seem to have an instinct about things! When we brought our daughter home our cat instantly knew her life was never going to be the same! I am sure that like you said Annie has brought a new light into her life just as it has yours! I absolutely feel that animals mourn the people or other pets they lived with who have passed away. I’m so happy that Rigby has a new little friend to watch over. They are adorable together, and Annie’s expression is hilarious! I love all 3 of your bubbies! You have an awesome pack! Annie is so yummy, I just wanna eat her up! She definitely does look like hubby, love the cheekers. I have no doubt that Rigby knows Maddie is gone and misses her even though she doesn’t understand what happened. I love the picture of Annie and Rigby. May it be the start of a wonderful friendship. .-= Kristin´s last blog ..Pukous Interruptous =-. I’m sure they will best buddies one of these days! .-= Lindsay´s last blog ..The Post Where I Have an Emotional Breakdown =-. That is so sweet! Rigby is so in touch…hugs! I’m sure that Annie & Rigby will be fast lifelong friends! I’m also sure that Rigby does realize the loss of Madeline & has mourned along with you. Dogs are very intuitive to emotions & sense things that even a person may not notice about themselves or others. I’m guessing that Heather is the “Pack Leader” since Rigby follows her so closely. My labrador is the same with me! So glad you are all home. what funny pictures. two to be framed together for sure. I love the look Annie is giving Rigby! Looks like she’s not too sold yet on Rigby’s awesomeness. She will be, though. I love that picture of Rigby and Maddie. How cute that you were able to get a similar picture of Annie and Rigby I’m sure Annie being around will be good for Rigby who has been missing her little buddy Maddie. .-= Lisa´s last blog ..Are You a Schedule Parent? =-. This melted my heart and brought tears to my eyes. What a sweet moment. I fully believe that pets feel more than we think they do. Bless Rigby’s sweet soul. This brought tears to my eyes. I am quite sure Rigby misses little Maddie. Dogs just know. What a great shot of him and Annie. I’m sure they will be the best of buds soon enough! Love those two pics. Rigby is the kind of dog that is so freaking cute she makes me want one, and I am totally not a dog person. .-= cindy w´s last blog ..that ol’ work/daycare thing again =-. Love the pictures of Maddie and Rigby!! And of course the one with your Annie. She’s totally telling him she’s a new fixture and to get use to it. God bless you and yours! Prayers every single day for you all. I’m sure this is a bittersweet time, just breath, pray, love and be loved. It’s OK. Maddie would be OK with you loving her sister with all that you have. You both are awesome parents! Love your blog and am sending you many hugs. Oh my gosh, I’m bawling. Not over Maddie or Annabel, but over Rigby. She looks just like Daisy, the dog I had growing up. She was a wonderful dog and I miss her so much. She’s been gone for 3 years now and I still miss her. The pictures are precious, though. As always, thank you for posting them and for sharing your lives with all of us. .-= Amy´s last blog ..Struggling… =-. I’m a “dog person” and have trained dogs for pet therapy, agility, and contraband detection. I can tell you without a doubt that they miss their people they bond with. I am sure Annie will be a wonderful new pack member and Rigby in time will bond with her. Another note, I watched the video in the previous entry and just wanted to comment that even though the topic was aimed at teaching our children to be grateful, it home with me. Things said were things I needed to hear more than ever right now. .-= Sarah´s last blog ..Flashbacks =-. I feel certain Rigby mourns the loss of Maddie, and I am sure Annie will help ease the pain a bit for Rigby and everyone else who loves and misses Maddie. That is a very precious little miracle you have there! You guys are just amazing. I am so very happy for you. Beautifully said….brought tears to my eyes – I’m sure you are right about Rigby grieving the loss of Maddie! I know Annabel has brought so much light to your life already….what a sweet blessing!! I can only imagine the bittersweet moments you are having right now…. but you are handling this with so much grace – truly amazed at your strength! Thank you so much for the photos and the Rigby update. I had been waiting to see the 2 together. I knew from previous photos and stories, she’d be taking care of Heather. Soon we”ll see photos similar to the ones of Maddie , Heather and Rigby snuggling together. I know Rigby has been mourning for Maddie , too. Now, Annie will help Rigby be joyful as she is all of us. Hmm , I wondered , too if you had painted the walls. I think Maddie was sending her approval. I have certain photos on the wall that will be out of place. This never happened until about 2 weeks after my Father died. The photos will be stationery for weeks or even months, some stress will happen with people he knew , and sure enough , the next morning the photos are all askew. Of course she noticeda misses piece. I am sure that she was just as delighted with Annabel as you are. ps. She has such GREAT hair!! .-= kbreints´s last blog ..Through the Lens Thursday, Flashback =-. I think Rigby probably does miss Maddie…I know, over time, he and Annie will have an equally beautiful friendship. I am thrilled that Annie has brought in the light…may you continue to heal. I am a HUGE believer in dogs having the sixth (and in some cases seventh) sense that we, as humans lack. You know what “they” say, dog spelled backwards is God. Keep up the good work with the pictures and your beautiful little girl! .-= Erin´s last blog ..Brad and Angie, oh no! =-. How beautiful! How very beautiful! .-= Michele´s last blog ..The Life I Might Have Had =-. Love the photos of Maddie and Rigby snuggling. Annie is just adorable and what a cute photo of Rigby checking her out. Can’t wait to see all the adventures they have together. Thank you for sharing. It looks like Annie is sizing up Rigby just as much as Rigby is sizing her up. Too cute! Soon enough they will be rolling around on the floor together. Rigby is such an awesome, protective little friend. It is so touching that she stayed with Madeline on that last night. I have no doubt that she misses Madeline in her own way. At the very least, she understands the distress that you and Heather feel. Iam sure that Annie and RIgby will definitely bond eventually. You have done a great job filling in for Heather. I am just amazed by how awesome you guys both are, and I am glad that Annie is bringing some light back into your lives. I was wondering what Rigby thought of Miss Annabel and now I know. I’m sure she misses Maddie. I think you hit the nail on the head when you called her part of the pack. Even wolves mourn the loss of one from their pack, particularly babies. I actually watched a documentary on wolves and when the pack lost a couple of puppies, the entire pack actually ended up depressed. They needed their puppies! .-= Jamie´s last blog ..WFMW-The Power of 10 Things. =-. .-= catherine Lucas´s last blog ..House hunting… =-. Boy, I couldn’t agree more! I CANNOT wait to see more pics of Annie! It is strange the love I feel for a family I never met and the sadness I have felt has been overwhelming. I cried so many tears of joy when Heather announced she was pregnant! And I feel like the more pics I see of Annie…well in some ways it heals my hurt I have had for this family. Also, it is REALLY stirring that feeling in me to have another baby! I agree completely with everything that catherine and Jenn said!!! Especially the part of wanting another baby now!!! Annabel has given me the baby big SO bad!! She is going to be in big trouble with my hubby! Love to all of you Spohrs, especially big sisters Maddie and Rigby!! That was a beautiful post. My heart breaks with the sadness that Rigby may feel… but also the happiness that is ahead for your family. The look on Rigby’s face is so dear. And never let anyone tell you dogs don’t mourn. They do; I’ve seen it. .-= J´s last blog ..Catching up =-. It is amazing that Annie, just a few days old, can look at Rigby as if to say,”Now THIS is a funny looking human.” Beautiful photos. Hope you feel better soon, Heather. Those are such cute photos! Thank you for sharing them! .-= Melissa´s last blog ..You Capture–Color =-. It looks like they will be friends in no time at all. Congratulations again. .-= Amanda´s last blog ..A Wordy Wednesday =-. Your family is just beautiful! What a great post. .-= Natalie @ Hope Springs Eternal´s last blog ..Happy One Week! =-. What awesome pictures. I just LOVE the look on Annie’s face, like “Who and WHAT the heck are you”!!! I would have no doubt Rigby feels the loss of Maddie. At the very least, she would be very in tune with you and Heather’s sadness, so I suspect, she felt the same sadness and misses her as much as you both do. Thanks for sharing your pictures and thoughts…they are priceless! .-= Beth´s last blog .."I’m not a baby! I’m a big boy!" & other recent Adam-isms (and a potty update – fun stuff!) =-. I think sometimes pets don’t get much credit for having emotions. I’ve heard people say that they don’t remember and they don’t have feelings and on and on, but I’ve never really bought into that. Our cat definitely mourned when our first dog died. In 2008 when my husband passed away, all the dogs and the cat were grieving. I’m sure some of it was picking up on my feelings, but I think they were feeling their own sense of loss that this primary member of their pack was gone. It’s so sweet how Rigby is guarding Heather. Give her a few days and she’ll figure out Annie’s place in this group and will likely welcome her with an open doggy heart. I’ve said it before and I’ll say it again: Annie is just darling!!! I’m so happy for you guys that she’s in your lives. I am so happy to hear that you have a little light back in your life. I am sure Annie and Rigby will be best of buds. We have a 3 year old son and a 5 year old Boxer. Our boxer gets up at night and will walk into our sons room, sniff him, then will walk back to our room, sniff me then go back to bed. The bond between a child and a dog is amazing. I’m so happy for your “pack”. Annie can in no way replace Maddie but she can certainly help heal the wounds with her smiles and cries and later her kisses and giggles. The day of my great-grandma’s (“Nan’s”) memorial service, my grandma’s dog (who Nan had seen at least twice a week and had always been best buddies with) looked positively desolate. She couldn’t eat or sleep or play. Animals know. But, as you said, I think that this means that animals ALSO heal and form new bonds, just like we can. Annie and Rigby are going to be adorable together!!! I know I don’t even know you, but I’ve been saying prayers for your family. Thank you for sharing. .-= Marianne´s last blog ..Two! =-. I have no doubt in my mind that your little Rigby noticed her Maddie was gone and that you and Heather were hurting terribly. Annie is so cute with all that dark hair, good jobs guys!!!! My father is a minister and he always talks about a professor he had in seminary that was firm believer that animals were spiritual beings – who went to Heaven, etc etc etc. I know that I believe Rigby’s little spirit has mourned for Maddie just like yours has – and I hope she and Annie can become best friends as well. Beautiful picture(s)! The two of you make some gorgeous babies! .-= Leigh´s last blog ..Yummy (times TWO!) =-. I am so happy for your family, that you both were able to be there for the moment that Annie came into this world and said “Hello!” and for the fact that you were able to take her home a couple of days later. I have read your blog, praying for all of you, since April 7th. I love the fact that Rigby is such an important part of your lives, and often have felt like your feelings for her mirrored my own feelings for my dog. My daugher just turned one, and up until now, her and Kabo have pretty much ignored each other. I was very relieved to read that Maddie and Rigby took a little while to bond…it gives me hope that Kabo and Samantha will one day be best of buds. Keep up the pictures…we love them! .-= Gail´s last blog ..Better Late Than Never =-. I tweeted Heather yesterday asking how RIgby was adjusting to sweet Annabel…so glad to see they are becoming friends! I absolutely believe Rigby misses Maddie and will bond and love Annabel. it is so sweet to read how Rigby is watching out for Heather as she heals. She’s certainly part of your family! .-= Michele´s last blog ..Baked =-. I’ve been silently praying and cheering for you all for months now- your story gives me hope that out of pain and sadness can come wonderful gifts again. I can’t tell you how much I love that you two are so close to your dog and love her so much. I consider my pets part of my family, so this just reinforces how awesome I think your little family is. I think Rigby very much misses Maddie and has mourned her with you. Congratulations again. Your family is beautiful. They will be best friends. I know Rigby misses Maddie. She may not remember her anymore, but I’m sure she noticed and felt sad for a while. Annie is going to love Rigby just as much as Maddie did. .-= Tara.´s last blog ..My Own Little World. =-. I have no doubt Rigby mourned–I know when my parents maltese passed the left behind westie was distraught. And, besides that she would surely have picked up on your moods just like she knows Heather isn’t feeling quite right yet. Animals are very tuned in to their people —even my (terror) of a puppy will cheerfully stayed in bed with me when I was sick last week– and he’d much rather be chasing something or barking at birds or playing with toys (and he could have had a LOT of fun this last time when I completely lost my voice–no scolding!) But, he stayed in bed watching me. I like to think they like to take care of us the way we take care of them, but I’m a softie like that. I also LOVE the new picture of Annie and Rigby together, it’s utterly precious. Somehow I think those 2 are going to become fast friends. .-= Sarah R´s last blog ..Bedtime woes: NO MORE! =-. I also agree with what everyone else is saying. Rigby for sure misses Maddie! So glad that Annie is know here to help everyone heal. The pictures of the girls with Rigby are priceless! Love the one with Annie! They are both sizing each other up. Too cute!! absolutely love that picture Annie and Rigby!!! Great capture! I hope that Annie can heal Rigby’s heart too! .-= Heather´s last blog ..Not me Monday… =-. Annie’s cheeks are ADORABLE!!! Such a sweet picture! I was sooo happy to log on today and see that Annie is safe and at home with you!! Our little ones are just two days apart! On the 20th, after tons of bed rest, meds and worries, we welcomed our son. I thought of you that day in the hospital when I finally had a minute to rest. “I’m 39 weeks, Heather must be 36.” So exciting! Congratulations Spohr family!! Annie is just so beautiful! So, so precious! .-= Karen´s last blog ..Bike rides. =-. That is the cutest picture! Rigby looks a slight bit skeptical, but so cute. I think dogs are one of the greatest creations in the world. When our daughter was in the hospital for almost three months, I used to catch our dog Kama sitting right outside her door, as though she were waiting. Our daughter came home, but is a completely different girl then before. This girl can’t walk, talk, chase Kama around the house or even throw food from the table to her. This girl can’t lay across Kama the way she used to. Yes, they can still spend time together, but Kama is well aware that there is something very wrong. She still lays in Aviana’s room while she is sleeping sometimes. When visitors come over she is extremely protective of Aviana. So much so that she will bark and even wedge herself between the visitor and the crib or couch where Aviana is laying. She is the best dog ever and I am so blessed to have her. I love how your family loves Rigby to death. One of my favorite parts of your blog is pictures of Maddie with Rigby and now Annie!!! .-= Jen´s last blog ..And the Winner is….. =-. .-= Kellee´s last blog ..Help Out! =-. Love the pictures!!! In the second one, Rigby seems to be thinking…who’s the new girl! They’ll be the best of buds. Thanks for sharing all the wonderful pics. Annie is beautiful! This looks like the beginning of a beautiful friendship. Of course Rigby missed/es Maddie: a part of her pack is missing and that is significant. But I am sure Annie’s presence is bringing healing to your whole pack! Rigby will find herself falling in love all over again! Thank you for sharing little Annie w/us: she is a beautiful, precious girl who is already bringing joy to the world! .-= Mary´s last blog ..You’ve come a Long Way, Baby =-. And now I am crying. DAMN YOU PEOPLE MAKING ME CRY. That picture is so freaking cute. .-= Aunt Becky´s last blog ..And Now, You Are One =-. Pets are like people and I do believe that he misses Maddie just as much as you do….I’m sure Maddie is hoping that her furry little friend will become fast friends with her sister! Your baby is so darn gorgeous! .-= Java´s last blog ..Overweight Child =-. .-= Mrs Chaos´s last blog ..When the Saints Go Marching In =-. .-= Snappy´s last blog ..Dog in the Fog =-. .-= coloradolady´s last blog ..Vintage Thingies Thursday: Re-run First Post ~ Black Bears =-. Haven’t been by in a bit. Congratulations on Annabel’s arrival. Crying happy tears at my desk at work, here. Annabell is so precious. Love that expression and all that dark hair. She’s a beauty! .-= Rebecca´s last blog ..Name Calling =-. I’m sure she mourned the loss of Maddie just as well!! If you ever get a chance to read “The Story of Edgar Sawtelle” they have a good chapter of the dog’s feelings they go thru when the owner dies….very touching since we as humans don’t think of their needs. Congrats on the new little one! Dogger Rigby *must* miss her Maddie. I wonder if Annabel smells like Maddie’s sister? I mean, probably, right? If only Rigby could TALK!! .-= Andrea’s Sweet Life´s last blog ..Strength =-. I read once that dogs actually can understand as much as a 2 year old can.. so they can understand a lot! Just like a 2 year old would miss her buddy, Rigby certainly misses her Maddie. She is a lucky dog to have a new little girl to love and cuddle. Beautiful photos of Annie, so happy for you guys. Babies laughing at puppies could possibly be the sweetest sound in the WORLD!! Rigby will always love and miss her Maddie, but she will adore her Annabel too. I am so happy that one day soon your house will be filled with the sound of a puppy and baby laughing and having a great old time. That is the way it should be! No one could deserve this blessing more, and I will forever believe that Maddie sent that angel Annabel down to you. I think this is such a beautiful idea, and a wonderful gift to give BOTH of Annabel’s big sisters- Maddie and Rigby. 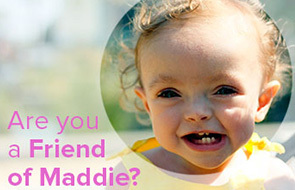 Let’s all donate even $5 or $10 to Friends of Maddie as a way to celebrate the beautiful new addition to the Spohr family! I know big sister Rigby would approve! I think dogs are very aware of their pack and very protective (and of course just like people there are good ones and bad ones). When I was pregnant with my second son and waddling around our fenced in yard a neighbor dog came barking down the road full tilt and stopped at our fence to bark aggressively at my toddler and myself. My black lab raced over and peed all over me an my toddler. At the time I was concerned that our dog had lost his mind, but a neighbor who breeds and raises labs informed me that our dog was marking us (ew) as part of his pack so the other dog would know he had him to answer too. Dogs know…who their packs are. .-= brit´s last blog ..You are only as loud as the noises you make =-. I am sure that Rigby missed Maddie. Annie and Rigby will be great friends for sure! .-= Debby´s last blog ..POST IT NOTE TUESDAY =-. It looks like love at first sight to me for both Annie and Rigby. What kind of dog is Rigby? He is just so adorable. Love those pictures. I am sure Rigby will be Annie’s buddy in no time. As for what dogs go through? I definitely believe that they mourn. And Rigby probably mourned for his friend Maddie and for his beloved owners. I think that dogs can sense grief in their owners. .-= Legally Fabulous´s last blog ..Overwhelmed =-. .-= Lisa´s last blog ..Why Do You Run? =-. Aww, this post made me all warm and fuzzy. I love reading about your new adventures with Annie! Congrats again. .-= Melissa´s last blog .."A New Renaissance" =-. I know Rigby missed Maddie. When my son leaves for college our dog Cody mopes around, lays outside his bedroom door, stares out the front window waiting for him to return. I believe that our dog loves us. Congratulations on your new daughter Annie. She’s beautiful. .-= Summer´s last blog ..He’s Baaaaaaack… =-. Love the pictures of Maddie and of Annie with Rigby! I have to say, Annie looks JUST LIKE her Daddy!!!! All that black hair.. she is just beautiful!!! I’m SO happy for you both! I wish you and your family laughter, happiness, light and joy. You and Heather have been through a lot and it’s heartening to read about Annie and the happiness she has brought already. There’s this video on YouTube of this guy greeting his dog as he arrives back home from Iraq. And the greeting from that dog is awesome! Dogs do not forget dear friends. Maybe that’s why I love em’. Such, a precious, precious photo of Maddie and Rigby. And another precious photo of Rigby checking out the newest addition (little Annie) to the family. One is silver and the other gold”! it’s never just a dog..
.-= MOMMA UNCENSORED´s last blog ..kablam! =-. I absolutely believe that animals grieve. There was a very sweet story I heard about when I was in England about dogs that would sit and mourn their fallen masters…I believe they are wise and feel. I also think that Annie will be Rigby’s buddy and help bring back the light – just as she has you. In no way replacing – but certainly bringing back some much needed sunshine and blessings. So happy for you all to have the happy new arrival of Miss Annie! What a cute photo. I’m sure Rigby misses Maddie like crazy. Rigby can now have a new buddy but will always remember Maddie. Everyone will and does. She is missed like crazy. Annie is such a doll. Another congrats to the both of you. .-= Nichol´s last blog ..Pampers Swaddlers & Cruisers with Dry Max Plus 3 Pack Freebie! =-. I definitely think dogs know more than some give them credit for knowing. They are truly special creatures. I love these photos and your post. I know Annie and Rigby are going to look out for each other. .-= Kelley Land´s last blog ..Green Tips =-. What a cute picture. I got chills reading this, I’m sure Annie and Rigby will be great friends! .-= Lisa @ lists in my pocket´s last blog ..Key Largo, Montego, Baby Why Don’t We Go…. =-. I had forgotten all about Rigby! It looks like she’s responding well to the new member of the family. So happy for you all, hope you recover fast! I definitely think animals grieve for their humans. I doubt that Rigby understands any more than we do “why” Maddie didn’t come back to play. I know I will never understand these things. I was amazed at how big your little Annie looks compared to your tiny Maddie. I think Annie looks like she’s nearly the same size in the green chair. .-= Jenny´s last blog ..Hippos and Baldies =-. .-= Patty´s last blog ..A shell of who I was and am… =-. Both pictures brought tears to my eyes. I’m sure Maddie was sitting between the two, introducing them to one another. So happy everyone is settling in beautifully. Animals are smart. They know. When I’m sick my dog brings me pillows. So I’m sure that Rigby felt something with Maddie’s passing. But I’m also sure that Rigby will soon love her new playmate! .-= mstomrs´s last blog ..Lets Get Ready to Rumble! =-. I tried to tell him your story and how amazing it is that Annie’s here and what a wonderful thing social media is, but all I got out were sobs and a bit of laughter from utter embarrassment! My boys had really puzzled looks on their faces, because it was a comedy. In short… I’m so glad you are all happy, healthy, and home. Enjoy every day with her!!!! She’s beautiful! And the dog is cute too LOL! .-= Jyl Johnson Pattee´s last blog ..Giveaway! Fishful Thinking Prize Pack With a Canon Digital Camera ($250 ARV) =-. That girls hair is amazing! Rigby and her look like they will be fast friends. .-= Melanie B´s last blog ..Wordless Wednesday-Third Birthday =-. yay! rigby meets her little sister, how sweet!!! I know the two of them will be the best of friends. can’t wait to hear about all the mischief they’ll be getting into. I bet Rigby was mourning a lost member of the pack, because that’s exactly what happened when Madeline passed – you lost a member of your pack. I’m sure, given time, they too will grow to be the best of friends. Because right now. . .lol I am NOT seeing it! I did laugh uproariously though at the photo of them together. Ahh, love at first sight! Remember Heather how you said Rigby loved to lie on your belly? I think he is just happy to finally meet the person that matched that heartbeat! .-= Dawn´s last blog ..i told you so… =-. ALL OF YOU bring light to my life. Thank you so much for sharing these moments! My favorite thing about this post is how obvious it is that Annie is Maddie’s little sister. They will always have a special connection. .-= Laurie´s last blog ..Gratitude =-. The picture is just beautiful. I am sure that Rigby does miss Maddie, and wonders what happened. And I’m also sure that she’ll know Annie is special and needs protecting. .-= pixielation´s last blog ..Going cold turkey. Or cold firefox. =-. How strange. For some reason I thought Rigby was a much smaller dog…almost like a small chihuahua or something. She looks very large next to Annabel. I think Rigby and Annabel are going to be the best of friends. I know that my youngest and our Sheltie are very close and anytime “her boy” isn’t home she sulks and pouts. Wow. That is just so sweet! I am sure you have heard it a million times, but Maddie had such beautiful eyes. This was beautiful. All my best to your lovely family. Thank you for sharing your stories and photos. This one totally made me cry. Dammit. .-= Laurie´s last blog ..When one door closes another one opens, and other clichés and truths that get you through the day =-. bawling in my coffee. beautiful. .-= Allison Zapata´s last blog ..The one with all the sap. =-.